Sub: Stepping up of preventive vigilance mechanism by CBIC field formations during the 17th Lok Sabha election process — reg. 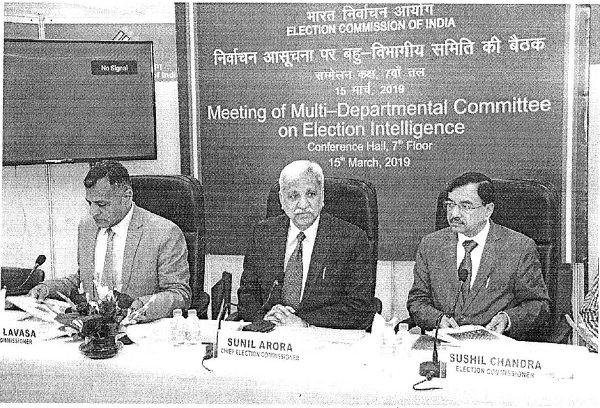 In the context of elections for the 17th Lok Sabha, the Election Commission of India (ECI) conducted a meeting of Multi-Departmental Committee on Election Intelligence on 15.3.2019. The ECI highlighted that the election expenditure monitoring mechanism, with its two thrust areas of keeping track of the legal expenditure incurred by candidates and political parties, requires coordination among the various expenditure monitoring teams and the agencies tasked with enforcement. The Commission desires that all enforcement agencies should have proper sharing of information for coordinated action. In this regard, the Press Note issued by ECI vide No. EC1/PN/30/2019 dated 15.3.2019 may kindly be referred to (copy enclosed). Strict vigil should be maintained on domestic as well as cross border movement of vehicles, trains, and private chartered flights as well as commercial flights. 3. Effective endeavour to accomplish the desired tasks requires coordinated efforts on the part of different Government agencies. Hence, it is imperative that intelligence and detection/seizure information be shared with other Government agencies on a real time basis. Close coordination should be maintained with Election Authorities as well. 4. Detections made, and results achieved may be brought to the notice of the Board on a day to day basis. Chief Election Commissioner Shri Sunil Arora along with Election Commissioners Shri Ashok Lavasa and Shri Sushil Chandra today held a meeting of Multi Departmental Committee on Election Intelligence. Heads of Tax Boards, Law enforcement agencies, Central Paramilitary Forces and representatives of Financial Institutions attended the meeting. Addressing the meeting, CEC Shri Arora said it is the constitutional mandate of the Election Commission of India to conduct free and fair elections. Conducting clean elections is now one of the biggest challenges in our democracy given the prevalent abuse of money power, particularly when it manifests in inducement of voters. He said Commission is determined to curb this menace and has issued detailed guidelines to monitor election expenditure incurred by candidates and political parties. The expenditure monitoring mechanism has got stronger over a period of time and larger seizures have been made by our enforcement teams in successive elections. He said individually and collectively the agencies participating in the meeting are the bulwarks of clean elections. The outcome of synergised action should exceed the commitments made. Election Commissioner Shri Lavasa pointed out that implementation of ECI’s instructions on field requires co-ordination among the various expenditure monitoring teams and the agencies tasked with enforcement. Sharing of Intelligence amongst the agencies should ensure that there is concerted attack on problems faced. He noted that multidimensional, multi-fanged crime needs to be tackled with coordinated action. He reminded the agencies that due follow-up action on seizures done in previous MCC phase should see demonstrative action against antisocial elements enough to feel deterred next time. He emphasised that mischief mongers are ever devising more ingenious ways to beat the system. Election Commissioner Shri Chandra highlighted that election expenditure monitoring mechanism with its two thrust areas of keeping track of the legal expenditure incurred by candidates and political parties for election campaigns, and more importantly, ensuring that there is no illegal use of money and other items for buying of votes, is vital to ensure clean elections. Use of money during the elections has increased by leaps and bounds in recent times and therefore there is greater need to have synergy amongst various enforcement agencies so that a collective strategy is developed to fight this menace. The Commission desires that all enforcement agencies should have proper sharing of information for taken coordinated action rather than working in silos. The senior Officers who attended the meeting included Shri P.C. Mody, Chairperson 86 Member (Inv. ), CBDT; Shri Pranab Kumar Das, Chairman, CBIC; Shri Sanjay Kumar Mishra, IRS, Director, Enforcement Directorate; Smt. Mitali Madhusmita, IRS, DG, CEIB; Shri Pankaj Kumar Mishra, IRS, Director, Financial Intelligence Unit-IND; Sh. Rajesh Ranjan, IPS,DG, CISF; Shri Rajni Kant Mishra, IPS, DG, BSF; Shri Rajeev Rai Bhatnagar, IPS, DG, CRPF; Shri Kumar Rajesh Chandra, IPS, DG, SSB; Shri Abhay, IPS, DG, NCB; Shri Arun Kumar, IPS, DG, RPF; Shri Sunil Mehta, Chairman, Indian Bank Association; Shri Rakesh Asthana, IPS, DG, BCAS; Sr. Level Functionary from the RBI.